Matthew Laird, a driver on the Olympic Line demonstration streetcar! I went down to visit the Olympic Line demonstration streetcar over the weekend, and talked to Matthew Laird, one of the drivers on the line! The streetcar, which is a project from the City of Vancouver and Bombardier, has been running since January 21, and huge numbers have come out to ride it between Olympic Village Station and Granville Island. Here’s my post from day 1 of the Line, plus photos and video from others. The enormous lineup for the streetcar! Click for a much larger version. And we at TransLink highly encourage you to try out the streetcar during the Games, as you can get a taste of how this kind of rail line could certainly be an option for transportation in our region. And really, how often do get to try out a modern streetcar in your own backyard? 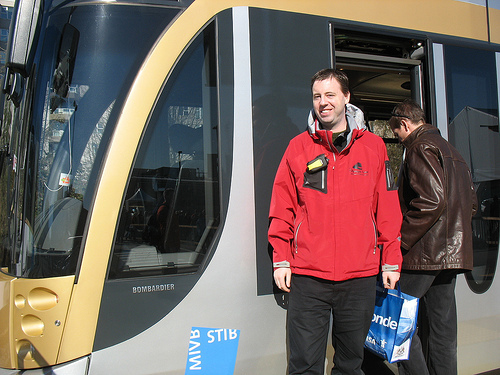 OK, now read on for Matthew’s interview about what it’s like driving the streetcar. How is it being a driver on the Olympic Line? Oh, it’s exciting. I’d be tempted to make a career change if this was available as a full-time gig. When did training start? When did you get involved in all this? We got our first hands on in December, when the cars were here and things were ready to go. So our first group was starting around then. And they became the on-the-job trainers for the people in subsequent groups. So what is it like driving the train? Well it’s very smooth! It’s very different than driving the old interurbans which we’ve been driving for the past dozen years. But they’re both fun and I’m really enjoying it. How is it different from driving the old interurban? The view over Matthew's shoulder as he drives the streetcar. The brakes are a lot more responsive, that’s the first thing to notice. When you want to stop, you stop right away, rather than having to anticipate a slight delay. You’re not rocking back and forth like the old interurbans, although that can be fun. But with the smoothness of this thing, riders can read a newspaper without worrying about it jiggling around. You can have a very smooth ride getting to your destination. It is. The AC motors underneath, we’ve been told they’re the most modern technology around. When you’re driving, what challenges do you encounter out there? Are there things you were surprised you had to think about? Well, there’s the fact that you can’t swerve out of the way of problems. You really have to keep an eye on what’s coming. It’s actually very simple to drive, in the fact that it’s go, stop, and ring the bell when someone crosses the track. Ring the bell. But you have to take into account things like your load and conditions. It is rails instead of rubber. In rain conditions, you have potential skidding to take into account. These do have automatic sanders, so if they detect any slide, they’ll kick in and make sure you don’t slide too much. And there are empty car loads compared to a full car. The calculation is that if you double the weight, you need four times the stopping distance. You really have to take that into account on busy days like this: you need to know to start your braking sooner so you don’t overshoot the platform. How is driving a streetcar different than driving a car? When I asked a fellow driver this he responded, there’s no clutch. But really for me I think of this question the other way around. I almost exclusively use transit in my daily life, so on days I drive to my shift because of the early start time I always find when getting in my car to go home I try to drive my car like a streetcar. You just get so used to the fast acceleration and how easily it handles. And more than once I’ve found myself reaching for the bell. So what are your shifts like for driving? There’s either four or six hour shifts. The first shift is six hours and then there’s four hours throughout the day. There’s approximately 20 – 25 drivers, and we all do about 12 to 18 hours a week. It is all volunteer, and we do this because we love to do this, and because we’re having so much fun. Like I said before, some of us would make a career change because we’re having so much fun. Are most of the drivers from the Downtown Historic Railway? 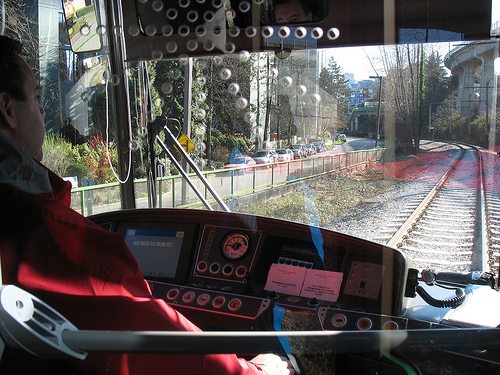 Most of the drivers are from the Downtown Historic Railway, because when you’re trying to find streetcar drivers, who else has driven a streetcar in Vancouver over the last 50 years? There are a number of ex-railroaders as well. And there’s just other people. Four of my friends from New Westminster applied, half of which are software developers, and they’re down here too. What has the customer traffic been like? In terms of mood? Any fun stories? Riders heading from Granville Island back to Olympic Village. Everyone is having a great time. And the interaction of the public is one of the main pieces, the points of fun in being down here. In that everyone’s happy and everyone’s excited. I have met a few athletes. No one I know, but just this morning, I was chatting with a pair of Swiss skiers. One was a jumper and one was a downhill skier, and that was a fun chat. They were telling me how much they liked Canada. You see the uniforms sometimes and you don’t quite know who they are! I remember just before the Games began, there was a large group of people all wearing Slovakia jackets walking from the village onto the train. We’re so close to the Athletes’ Village, we get them coming for a ride to Granville Island or going for a ride. Some of us were kind of hoping we’d see someone like Joe Biden or someone down here, since they have the whole rail push in their economic stimulus package in the U.S. And this Bombardier car is the exact kind of rail that is needed with the stimulus package there, and for here. We’re encouraging people to give this a try, because you never get to try a new form of transportation in your own city. Right. Those who travel around North America and Europe are very familiar with streetcars as a form of mass transportation in cities. But in Vancouver, if you haven’t travelled around, you aren’t familiar with this. And this is really showing the public that it’s a very viable way to get people around Vancouver, and hopefully it will become part of the Vancouver transit network. You have to have a full comprehensive system involving buses, heavy rail, and streetcars are a part of that for a mid-range of transportation around. Are you finding locals are responding to the Line? The locals are very excited and they definitely want to see this stay around. If that message gets to the politicians, we’ll see what happens! If we were to take a vote down here in the line of who would want to see it stick around, I think it would heavily be on the “keep it and expand it” side. If you’d like to learn more about the streetcar, please visit the streetcar project’s page at the City of Vancouver website, or at Bombardier’s site. Joe Biden! Is he a rail fan? I know he used to take the Amtrak train everyday from Delaware to Washington DC instead of living in DC. By the way, those streetcars are mighty fine! :)When I finally escaped from the house, I took a trip to Granville Island and downtown doing touristy things. They’re quiet and those leather seats are very comfortable. I think streetcars would be a great link in our transportation system. I don’t believe Joe’s a rail fan in the classic sense (collecting memorabilia etc) but the policies from the Obama administration have been very rail-friendly. Glad you enjoyed the Olympic Line! 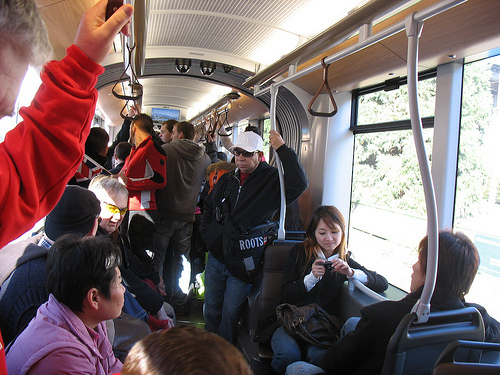 I see that the Olympic Line streetcar is getting quite popular, with riders, politically, and in the media. Do you know what the plans are for it, or more likely the plan to make a plan? Well, to start off the questions, I’ve read that they’d like to extend it around False Creek up to Waterfront, but that duplicates the 3, 8, and 19 from Science World up. Hooking up with the Expo line seems like the most logical choice. If the line can be run off street, is it better to run a traditional track layout with ties and ballast, or the more modern cement and clips? It seems that a cement bed is more difficult to make repairs on, normally requiring a total track replacement every two decades. P.S. I love reading the blog. Keeps me from getting too homesick. I too like the Flexity. I think it made the Swiss House, Atlantic House and other Granville Island activities accessible. But like a lot of things, are we willing to pay for it…. I hear Bombardier spent a lot of money to rebuild the rail line ($1.8 million?). That will be our Olympic legacy. The ($400,000 x 2) streetcars are going back to Brussels (slightly used and abused by a Jeep). I have no idea of the shipping costs. If we want the streetcar to stay and extend to downtown, we are going to need to pay for it. But with competing government expenditures (education, infrastructure, etc…. ), is the streetcar a priority with struggling taxpayers on limited salary increases. Another way to demonstrate their value is for Vancouverites to ride and fill the weekend streetcar service on weekends. A high ridership may see service expanded to weekdays. Over time ridership will build and the viability of a streetcar to fund itself may come about. The Canada Line had the 98BLine to thank for demonstrating and establishing a ridership foundation. In less than 6 months operation, we have surpassed CLine capacity. At this very moment, I have no idea what the plan is. We are encouraging people to try it to get a feel for streetcar-like rail. I think we will find out in the post-Olympic period just how the streetcar will be factored into future plans for Vancouver transit and what timelines there might be around it. But Evergreen Line is still a huge priority! – There is sufficient demand presently for a streetcar from Waterfront to Granville Island based on street surveys. – Alignment for this route and extensions have been well planned, with the necessary right of way established. – It’ll be a tourist draw. Having ridden streetcars in Toronto for several months, and once in both Geneva and San Fran, I have mixed feelings about them. They are smooth and nice to ride at a leisurely pace, but I’m not convinced they are worth the investment in a mixed traffic scenario. One point I haven’t seen is regarding the disruption of track laying and replacement for businesses along the final route especially given the sensitivity to this issue. I didn’t want to travel down Dundas St. in Toronto during that replacement.